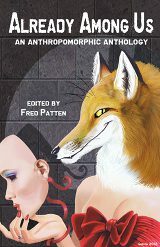 Already Among Us: An Anthropomorphic Anthology (Kindle), compiled by Fred Patten, is a collection of 14 science-fiction and fantasy stories from outside our fandom, focussing on humanity's interactions with intelligent animals (or animal-like aliens). Fred introduces each story to put them into context, and the book's font is large and easy to read. The layout, however, could have benefited from having the authors and story titles printed along the tops of the pages. Without them, it's much harder to pick up where you left off, without using a bookmark. The stories can be divided into two distinct time periods. Six were written between 1942-1962 (the tail end of SF's golden age); the rest are from 1991-2006. I was surprised that there was nothing from SF's new wave/experimental period in the 60s and 70s. Compare: Watts Martin's review of Already Among Us. Being an anthology, this is going to be hit-and-miss for each reader. I thought it was a decent collection, and quite eclectic in content, although nothing bowled me over. Granted, that's difficult to do. Ken Liu's recent story "The Paper Menagerie" is a notable exception. Usually though, it takes a novel-length work, where there's more time for dramatic build-up and character exploration. In any case, if you want to expose yourself to a wide range of story-telling styles, this certainly delivers. Not much else I can say about them collectively, so what follows are my individual comments about each work. This is a light-hearted comedy that has fun with the idea of Mickey Mouse and (now extremely dated) war-time German stereotypes. A scientist sends a mini-rocket into space with a live mouse inside, where it attracts the attention of little aliens living in a hidden asteroid orbiting around Earth, who prefer to be left alone. Using their technology to make the mouse intelligent, they gather intel about Earth before sending the mouse back, reasoning that if the mouse can spread his intelligence to other mice, a human-mouse conflict would delay human progress, and give the aliens a few more millennia of peace and quiet. When the mouse gains the ability to speak English, his comedic accent is as ridiculous as the German scientist he learned it from - but it's so over-done that it may annoy rather than amuse. While experimenting with animals to speed up reaction times in air pilots, a scientist discovers that one of his rabbits has become intelligent. The rabbit understands human speech, reads the newspaper, and very much has a will of her own - but isn't thrilled about the direction the research may soon be taking. What I like about this story is that the rabbit doesn't talk, using only body language to get her attitudes across. It makes her seem a little alien, so it's impossible to know exactly what she's thinking. This story, along with the previous one, were the ones I truly enjoyed reading from the pre-1970s selection. A British scientist discovers a local dog has given birth to a litter of abnormal puppies, and saves one of them from being killed by a lowbrow, thuggish janitor. When the surviving dog's intelligence begins to manifest, the two of them disagree over ownership. The janitor unfortunately wins, and the "wonder dog" becomes his source of income, travelling and performing stage tricks. Secretly, the dog sneaks away to visit the scientist, learning as much as he can. But canine loyalty is built into him, and he must always return to his cruel master. As Fred himself points out, this story has not aged well. Although mankind has colonized the moons of Saturn, social roles are still firmly locked in the 1950s: men are scientists and politicians; their wives organize society dinners and bake cakes. Ronar is a genetically uplifted lupinesque ex-carnivore, whose scientist creator has brought him along to judge a cake contest. He judges each cake on the merit of three crumbs (dough, icing and filling), in which he can discern each and every ingredient. This is another thing that felt very 1950s SF - a cold, scientifically clinical view of the universe. Less important were texture, presentation, or how flavors compliment each other. Overall Ronar is a tragic figure, the only one of his kind, unlikely to ever be accepted by humans and nostalgic for his former existence. Still, what makes the story interesting is how he fights back his bitterness to try to remain objective - a difficult task, given some of the contestants he has to deal with, and his ability to hear what they say about him from the other end of the room. Another work of comedy SF, this is one of a series of short stories about the Hokas, a race of teddy-bear-like aliens. Fred recently penned a more detailed write-up about them. I know I was supposed to laugh at this story, but there was a 1950s naïveté to its premise. I couldn't suspend disbelief that an alien race would so wholly adopt elements of human history and fiction and have so little culture of its own. Anyway, this is a story about their human ambassador stuck in a Hokan reenactment of 18th-century swashbuckling and piracy adventure novels. Their bearish-ness felt underplayed, and their adoption of human culture made them seem even less alien. The whole thing felt more like a Star Trek trapped-in-the-holodeck episode, where the only way to escape is to play along and beat it at its own game. Two things made me laugh: The fact that every Hokan ship had a pirate flag stored away (just in case), and that one of the sailors was obsessed with role-playing a Swedish Viking who wanted to go to Constantinople. All that said, if you want a story that doesn't take itself seriously at all, and does so with gusto, this is one of the better titles in the anthology. It just wasn't my thing. In most mainstream anthropomorphism, species stick to their own kind. But in this short story set on the planet Eetwee, over time the various species have combined into hybrid chimeras. A human visitor socializes with the locals, who include Dr. Birdmouse, Mr. Snakepig, Dr. Leopardsheep and Miss Moosevulture, amongst others. In their opinion, the human's mono-speciesism is backward and quaint; he simply hasn't had the advantage of the elixirs that give them their intelligence and ability to diversify their genetic pool. Tiring of their company, when the human tries to run a scam on them, he inadvertently meets a terrible fate. At this point we get to the more contemporary short stories (1991-2006). In this story, cats and dogs are sentient and can talk, and are either human pets or homeless strays. Wanderer (a manipulative cat) has had enough, and talks her fellow pet, Herb the dog, into making a political statement by leaving their master's home. Herb has trouble finding work and making ends meet. Wanderer, meanwhile, embarks on a mass-marketing campaign for animal rights, although she seems more motivated to achieve fame and riches for herself. The way that Wanderer outright up-and-left her original home for ideological reasons reminded me of Derek Zumsteg's story, "Conversations With and About My Electric Toothbrush". Of all the stories in this book, this one's a bit of a cheat; Michael Payne is a longstanding furry. This story, however, was published in Asimov's Science Fiction, well-outside of the fandom. A human schoolgirl has accidentally shifted into a parallel universe, and hasn't come to terms with her situation yet. Travelling with a cat and other creatures along a river, they search for a legendary being that can supposedly grant wishes and get her home - although there's the additional problem of not knowing which one of 40,000 possible Earths she came from. This is the longest story in the anthology, and in my mind is also the most suited to its science-fiction theme. Mankind has created the Hathi, bioengineered intelligent elephants. (h?th? is Hindi for 'elephant'.) While trying to set up a colony on a distant planet, the settlement has come under threat of attack from an aggressive alien race. Dr. Roberta Schurman, a human scientist, must embark on a long trek with the Hathi colony to reach a place of safety. This is a great example of trying to imagine what kind of culture and society would emerge from one of our terrestrial species. Definitely my favorite in the whole book. A futuristic re-interpretation of Beatrix Potter. Peter Rabbit is now a revolutionary guerilla, hardened and grizzled, who has come to free his fellow bioengineered animals from a theme park and their sadistic owner, Farmer McGregor - who is no longer entirely human himself. Short and dark. What if dogs could type and use an online dating service? A tale of canine correspondence, that's all that needs to be said about this one. It's quick, fun and believable, complete with dubious online messages from foreign countries. This is a story about Rodney, a laboratory mouse given intelligence, and his increasingly worsening relationship with the scientist doing research on him. All Rodney wants is a little more intellectual stimulation, and to find out more about himself, his thoughts and the world around him, but Dr. Krantor only wants him to run through more mazes and focus on immediate research goals. To fight off boredom, Rodney befriends Krantor's young daughter, which only makes things worse between him and the doctor, because Krantor is not getting along with his ex-wife nor her new boyfriend, and doesn't like Rodney's growing curiosity. This story builds up at a good pace. A re-imagining of The Three Little Pigs, only modernized and with more world-building put into it. Silly, but fun. Fred thinks there's a reference made to a 1933 Disney cartoon, but I think it's more likely it was partially inspired by a 1957 Looney Tunes short, Three Little Bops. A man goes on a road trip after a break-up, and picks up a stray (talking) cat along the way, only to find out that the cat has no problem killing humans it doesn't like. This was an odd read. Although the human was definitely concerned about his own survival, he showed a remarkably low amount of stress about his situation. He wants to move on with his life; while the cat still has issues to overcome. Already Among Us: An Anthropomorphic Anthology is available from Legion Publishing in hard and soft cover, and via Kindle.